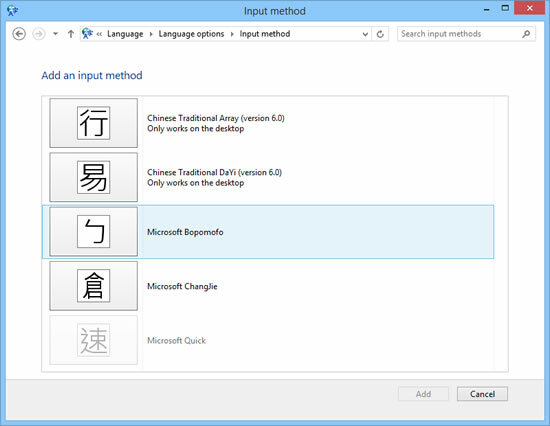 This page is for anyone who needs a Pinyin input method to type Chinese characters in versions of Windows 8 released outside of China. 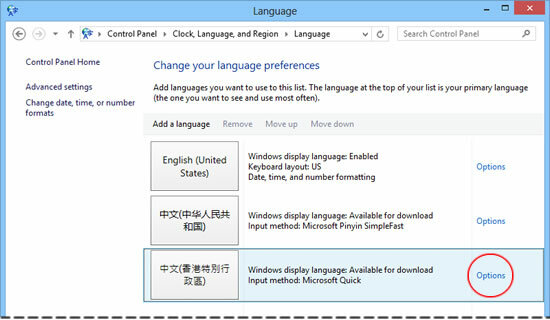 See also my quick introduction to Chinese language features in Windows 8. The Control Panel in the Desktop is still the best way to add languages, even on a Windows 8 RT tablet. I don't recommend using Search, especially since Windows 8.1, as the "Add a language" option offered in Search will now take you only to the tablet side of the settings. Some of the desktop language options you may want could be inaccessible from there. 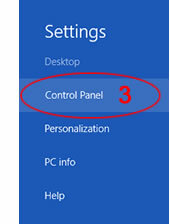 To open the Control Panel, go to the Desktop, and if you have a keyboard press <Windows> + I. You can also hover your pointer over the upper or lower right corner (1), or if using a tablet swipe from the right. Then in the Charms panel click or tap "Settings" (2). Then select "Control Panel" (3). If you are using a tablet and find this difficult, it does get easier in the next panel. 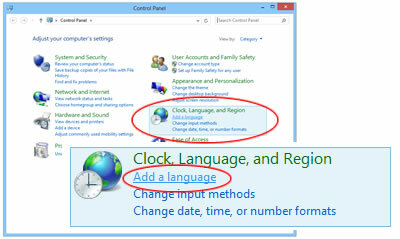 But if you have already completed Windows 8 setup on another PC or tablet, you can sync language preferences to your new device. Here's the official Microsoft page on syncing Windows 8 settings. The Language panel is more finger-friendly in Windows 8, but there are still a few text links to poke at when adjusting various options. When the panel opens for the first time, you'll probably see only one language. This is where setup gets truly different from older versions of Windows: big square buttons to tap on, instead of long lists of little checkboxes. Scroll down to the Chinese IMEs, then double-click or tap "Chinese (Simplified)" and/or "Chinese (Traditional)". Chinese (Simplified) and Chinese (Traditional) have lines on their right, to indicate you have multiple choices inside. And indeed, you can select more than one "regional variant". The Simplified choices are PRC or Singapore, which in Windows 8.0 offer only the Microsoft Pinyin (MSPY SimpleFast) input method. 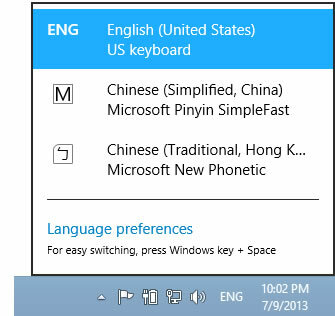 In the Windows 8.1 Preview, both regional variants also offer Google Pinyin and Microsoft Wubi. Then select Microsoft Bopomofo in Windows 8.1 (formerly called Microsoft New Phonetic until Windows 8), and/or other input methods as you wish. I will show you how to change the keyboard from Zhuyin to Pinyin on the next page. In the last screen shot here, you see me opening the IME menu from the Desktop Taskbar. Notice now that you've enabled more than one language, you can open the Language control panel from the "Language preferences" link at the bottom of this menu.